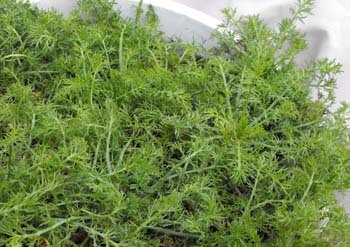 A non-flowering cultivar of Roman chamomile, Treneague is characterized by its low evergreen, fern-like foliage and forms a fragrant mat reminiscent of sweet honey. Light golden green webs grow out radially like florets. English gardens can be found swarded with it; can be mowed and maintained much like a standard lawn. English chamomile thrives in hot, dry, sunny, well-draining soil; will survive a mild winter, and is deer resistant. Can be split and replanted for faster spread. Height 2-4in; spread 10-12in.